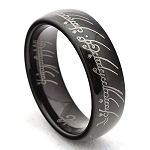 Tungsten Carbide Laser Engraved Elvish Lord of the Rings This silver colored laser engraved tungsten ring features the engraving made wildly popular in The Lord of the Rings. The ring is a replica of the One Ring with precise laser engraving, which brings out the magnificent elvish inscription. "One Ring to rule them all, One Ring to find them" on the outside "One Ring to bring them all and in the darkness bind them." on the inside. This Tungsten ring will never tarnish, scratch or bend. It comes with free shipping and a black velvet box! 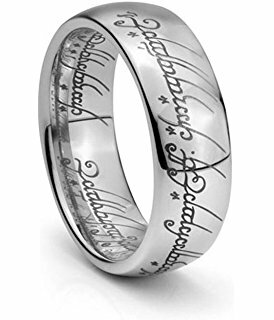 A: This ring is a solid tungsten carbide ring, just like the rest of the tungsten rings we sell, but due to the 'Lord of the Rings' script, we informed the factory to not use the 'Tungsten Carbide' stamp in the middle of this ring. Was this answer helpful? 44 of 50 Customer(s) found this Answer helpful. 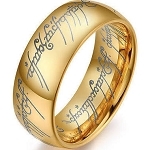 The Lord of the Ring styles can not be engraved on since they have the script engraving from the Lord of the Rings on them. Also, if your husband wears a 6 and it is loose, I would just go down 1/2 size. Hope this helps! Was this answer helpful? 16 of 21 Customer(s) found this Answer helpful. Q: Without knowing my ring size how do I order? You can go to a store and get your ring sized, that would be the best way and it only takes a second. Another trick you can do it order your shoe size. Your shoe size is going to be close, if not the same to your ring size. If you need to exchange it for another size, it is no problem and there is no charge for this. Q: Can I get this ring in size x1/2 which is 21.4mm ? A: Of course, that would be a size 12.5 ring here in the US. Order the 12.5 and you will be all set! Q: It looks like this ring has a seam in it, does it. Or is it all one piece? I LOVE THIS RING. I BOUGHT THE SILVER LOTR RING AND REPLACED MY OLD SILVER WEDDING BAND. IT STILL LOOKING SHARP. NICE PRODUCT! I have a the Lord of the rings, ring that I have always wanted. My eyes open up wide went I saw this ring. It looks just like the one in the movies. But this one is mines, nice and polish. And Tungsten have outstanding rings, I have just four rings so far. My co-workers want to know where I got my rings from, and I told them Tungsten rings on-line. This ring is much more impressive in person. It is beautiful and love wearing it. The ring arrived in a timely manner. The quality is excellent. I will definitely do business with these group again. This ring is impressive! Feels strong, fits great! Superb quality! Loved the ring and it fit perfectly. I love the fit and the feel as well as it's appearance. Everybody I know has complimented me on it. As advertised, Avery sturdy ring. I think it would work well in cosplay events. Awesome looking ring, comfortable fit. Looks very classy. Couldn't go wrong with this purchase, now contemplating gold Lor Of the Rings. Great weight! Stunning visually! Exquisite! And in half sizes. Perfection!!! Love the detail on this ring and the super fast shipping! what more could you ask for ... awesome looking and economical to boot ! Looks great & my wife gave it to me to replace my wedding band. This was a gift for my son. He loves Lord of the Rings and is very pleased with the ring. Perfect fit and very comfortable for every day. Quality and weight of ring is better than I expected. Very nice looking ring. Arrived in a timely manner. Considering what other products to order from this company, I'm that impressed! The ring is beautiful and the laser etching is flawless , its a very nice item for any LOTR lover. I had to exchange my order for another size and they were very helpful and quick to send back the correct size. Very easy to deal with . I ordered this ring for my hubby. He is very much into LOTR. He absolutely loves it and always has it on him. He's received much praise from his work buddies regarding this ring, it's solid, heavy and beautiful. We are happy with this purchase. If it came in gold, I'd buy myself one. Ordered this ring as a surprise for my husband for our wedding as his wedding band. He loves it. It is heavy duty, loves the comfort fit, and the detail is amazing. Unfortunately they sent the wrong size so we are awaiting the replacement. The customer service at tungsten fashions is excellent. Very pleased and will order more in the future because of the quality of the product and the care of the staff. Thanks so much!